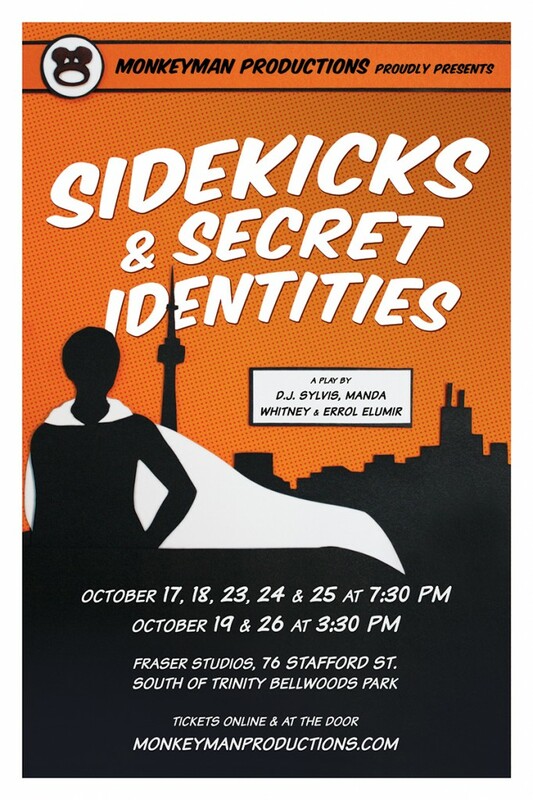 The newest theatrical anthology from Toronto’s geek theatre company is shaped around four instalments of “Sidekicks”, a rumination on the role of henchmen and second fiddles by Manda Whitney & Errol Elumir (of Debs & Errol). Starring Andrew Gaunce, adorable as a hapless but mouthy minion, and the charming Jordi O’Dael in the much more complex role of conflicted sidekick Flex Girl, “Sidekicks” is at its best near its conclusion when the overly cute banter and comic book mcguffin exposition fall by the wayside and the characters are forced to balance their mutual respect with the animosity dictated by their bosses being enemies. As much as I usually favour the Monkeyman plays that focus less on the inside-baseball realities of geekdom, I was impressed to find that the most interesting (and relatable!) character insight in “Sidekicks” comes from a comic book reality that doesn’t really translate to more mainstream adaptations of the material- the changing human face behind the masked legends (Robin has been like seven different people in comic book history, for example, a fact that surely escaped you if Christopher Nolan taught you everything you know about Batman). Flex Girl’s insecurity about her predecessors is one of those achingly human arcs best expressed in the context of the fantastical, which in my opinion is pretty much the best reason for making geek theatre. Between the four parts of “Sidekicks” are two short plays by Monkeyman’s resident playwright DJ Sylvis, both of which reflect the playwright at his best. The second of Sylvis’ two plays is a remount of “Super”, the beautifully mundane tale of a struggling actor who wears a Superman costume and poses with tourists for tips. In its original incarnation as part of the 2013 Simian Showcase, “Super” completely won me over and it remains my favourite Sylvis text (though new Supes Sean Kaufmann is missing some of the sweet sheepishness that really drove the pathos home in Cameron Johnston’s original portrayal). Sylvis’ other play “Fortress of Solitude” is similarly melancholy though in a more strictly geeky way. Feeling almost like a response to “Captain Incredible versus The Girlfriend” from the 2012 showcase, “Fortress” is about married couple Force Girl and Paul dealing with Force Girl’s decision to abandon her secret identity and become known full-time as Force. Beneath its superheroic trappings (and the terrible costumes said trappings necessitate), “Fortress” is a modern divorce drama about a woman whose self discovery and determination to fulfill her potential leave the man she loves behind. The only actor appearing in two substantial roles, Kaufmann struggled on opening night to stay on top of his lines, detracting from the naturalism of the scene and the strong performance from Kelly Preeper as Force Girl, but the thematic strength of Sylvis’ script was nonetheless apparent. Paired with “Sidekicks” and “Super”, “Fortress of Solitude” strikes the exact balance that best serves both Monkeyman’s fantastical sensibilities (“Super” is maybe a little too real-world to really fit in) and the emotional honesty that they’re capable of portraying when all the stars align.